Before! 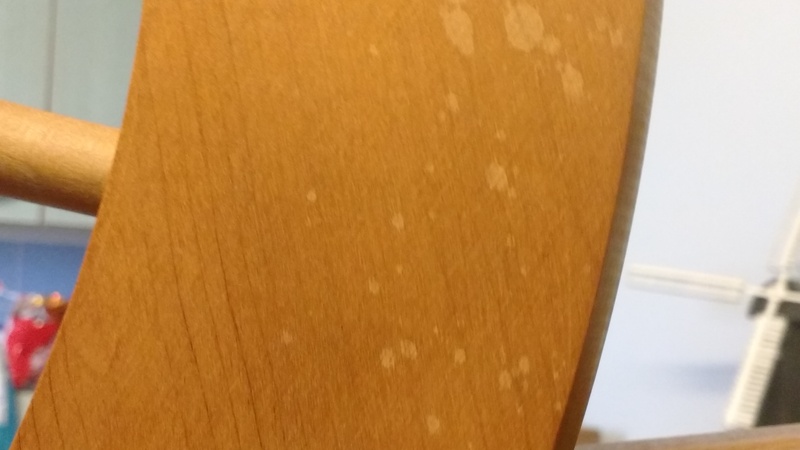 A bit of water damage; bleached-out and discoloured wood. Nothing major. 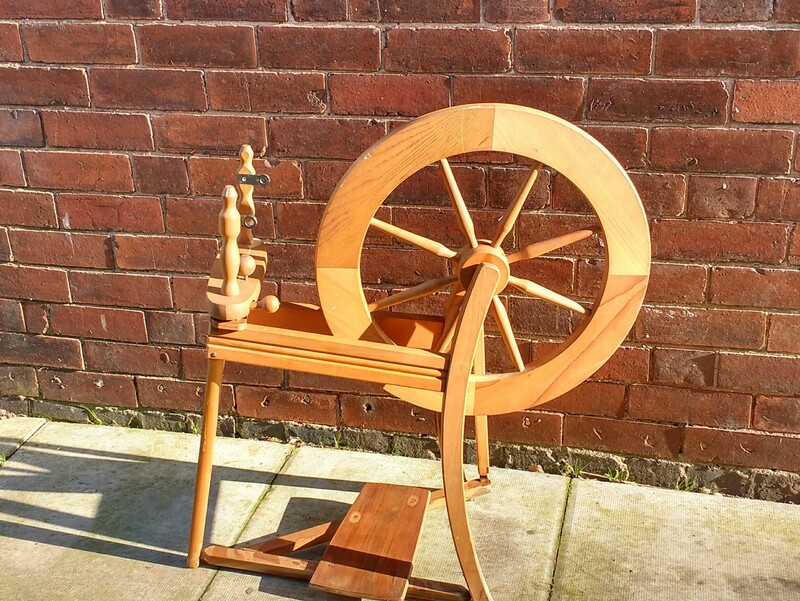 The week before, I had messaged a very helpful spinning teacher on Ravelry, and asked how to go about getting a spinning wheel or two donated, so we could teach at demos and maybe elsewhere, if there proves to be a demand. The kind of wheel I had in mind was something like an Ashford Traditional. My own wheels wouldn’t be much use. One is too fast for a beginner; it would be analogous to a learner driver getting into a Formula One car for their first driving lesson. Scary. The other, has proven too delicate to be transported around very much (in fact was returning to us, that very day at Kendal, from a stay in the spinning wheel repair-shop at Woodland Turnery). It is a lovely wheel, but not one suitable to be moved around a lot; more temperamental thoroughbred when what we need for demo-ing and teaching is a sturdy pit pony. I love both my Timbertops wheels dearly but neither are remotely ‘teaching wheels’. Almost every spinner has tried, used, or owned as a beginner – and many kept far beyond being beginners – an Ashford Traditional or the little Ashford upright, the Traveller. I’d go so far as to say, from my generation (learning to spin in the 1980s) most people in the UK probably learned on one of these New Zealand made kit wheels. They were the most widely available wheel, and had a reputation for being reliable; slow enough for a learner but with the capability to grow with you; and pretty well ubiquitous in the spinning world, to the point that I felt a bit of a freak, having learned on a Haldane, then moved on to Jensen and Timbertops wheels. It is the spinners’ equivalent of ‘Never seen Star Wars’ – never spun on an Ashford. Few people can claim that. Yet for me, it was the truth. Never spun on one, or so much as touched one, til one evening I got the chance to fettle one. One of my most treasured memories (and I have a lot) of my late friend Caro, is the evening she asked me to go round to fettle her secondhand Ashford Traditional that she hadn’t quite got her head round, yet. I took my own wheel with me, and spent a very happy evening fettling, tinkering, messing and finally – after over 30 years as a spinner – playing on a Traditional. And eventually, even got her spinning on it! We meant to meet up and do our little spinning bee much more often, but ‘life gets in the way’ etc – somehow these plans never quite come together and before you know it, the chance is gone. Lost opportunity. I had her spinning and smiling that evening, though and that is a great memory. Now I’m a left-handed spinner, which means I can’t spin on a wheel like the Traditional with the flyer to the left of the drive wheel, for any length of time without getting back ache. But for the odd hour, it’s fine and to teach someone else (who is spinning right handed) it would make perfect sense. Yet, I have to admit, once I had Caro’s (1970s?) Traditional up and running, I rather liked it, to my surprise. To the point, I started looking on eBay but they always seemed to go for more than I could afford, the very word ‘Ashford’ being a selling point, and I really only wanted it to teach other people, because it has Scotch tension, and is the kind of wheel they’re far more likely to end up buying. So, there we were in Kendal, being offered a wheel. I didn’t want to get my hopes up it was an Ashford Traditional; precisely the wheel I’d been about to put an ‘In Search Of’ post up, on Ravelry, for. The lady said she could go down to the car park, after a preliminary walk round the show, to fetch the wheel. I thought it was too good to be true. She’d probably not return to us, or find someone more worthy. (She’d already walked right past a lovely spinner in the doorway of the room where we were and somehow made her way straight to us, at the back of the room). I tried to take my mind off it, and there were plenty of lovely people to meet and chat with – so a bit of time passed and t- whilst I went for a wander leaving Worser Half in charge – there the lovely lady was, with an Ashford Traditional under her arm. I missed my chance to chat with her again, as the wheel was sitting there, by our stuff, when I returned from my amblings. I wish I’d had the presence of mind to ask her first name, when I saw her, at least! But I was a bit stunned to meet with such serendipity and kindness. All I remember she told me of the wheel was that it had been used to teach many children, and that it had been stored in a slightly damp place (garage?) the past few months. I’d been a primary teacher probably at the same time this lady was teaching and had also taught many, many children to spin but only ever on spindles. Teaching is something you never really shake off, and I have been thinking for a while, of starting to teach spinning in the new year. We had gone to Kendal with our small car packed up to the ceiling to demo. And had left precisely enough space to fit my repaired wheel, Betty, in for the journey home. So after the show, getting the Ashford in the car was a bit like doing Tetris in real life. And it took us quite a few goes, but eventually, we got it and we managed to stuff the car not only with the demo stuff, and my own wheel (Thankfully, we’d not done the usual thing and taken our Great Wheel) but also the new wheel. I knew nothing of the history of Ashfords, so did a quick bit of internetting when we got home, and discovered the Ashford Traditional Time Line. A handy guide to help figure out when your Traditional was made. This put the wheel at maybe around 1980/81 (without the click fit bearings, but the tension knob is in the same place as the ’81). This very wheel may have been standing in a shop not long before the time I went to buy my first wheel, in 1984. Which is a strange thought. Have to admit, this late 70s-ish is my favourite type of Traditional, aesthetically – I hadn’t consciously noticed, over the years, but the spokes became fancy turned ones not long after this. I prefer the plainer spokes of the 1970s – more in character with the 20thC style of the wheel, those plainer spokes. I like the wheel’s nylon bearings as well, only ever having had wheels with leather. Which has its limitations. The wheel is sturdy enough to be transported around, and after many years looking at old, old wheels as well as some recent but old-school beauties, like Timbertops, I’m actually quite appreciating this wheel’s no-nonsense utilitarian, work-horse style. A bit like my favourite spindles tend to be the plastic, 3D printer made ones in neon colours because I spend a lot of my life looking at the old lead ones! As these wheels started being produced during wartime, (1940, the Ashford Homecraft, a direct ancestor of the Traditional, according to the Timeline), it is also perfect timing for us, given the current research work I am doing on the Land Army. The perfect wheel finding us at the perfect time, in other words. And a loud squeak came from the leather con-rod joint. Replacements are available but in our case, we couldn’t replace it as the screws holding it in were seized, so instead we have liberally applied dubbin over the past couple of weeks, and now the squeak is now minimal and will hopefully be eliminated over time, with more dubbin. I’d prefer to use my Brooks Proofide, I keep for my leather bike saddles, as that’s the best leather conditioner there is – but predictably, now I need it, it has proven elusive, so the wheel got cheap dubbin instead. 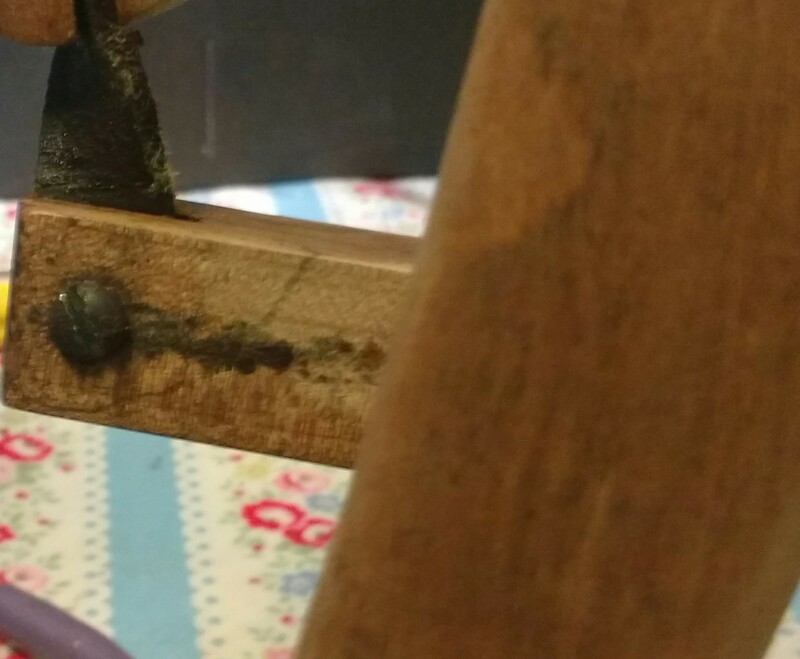 After sanding, the wheel drank a couple of coats of oil. It’s now really ready for another coat – apparently, coats with gaps of hours or days (or weeks) between is a good idea for long-starved wood. 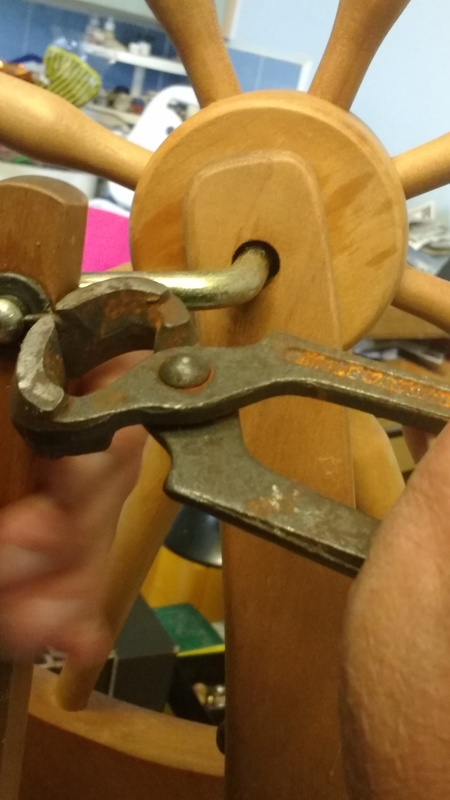 The kind lady who gave us the wheel said she’d lost the bobbin brake on the way, (“I swear I saw it when I put the wheel in!”) so we replaced that with a £1.99 one from Fibrehut. Older wheels have only one spring on the bobbin brake – newer ones have two; one either side of the mother of all. So the current kits have two springs – which we stuck with. (Seem to recall I may have used an elastic band on Caro’s, unless the old spring was there – not sure). I have spun on a double drive all my spinning life, so Scotch tension is a novelty. Apart from the missing bobbin brake, its only other problem was the lone bobbin’s core had swollen and it had got stuck on the flyer shaft. We soon got that off, and got a couple of replacement bobbins. The shaft has cleaned up just fine. I oil this pretty well every time I sit down at any wheel, so it should not be a problem, from now on. The wood of the entire wheel was stained in places (but not warped or split). The back end of the mother of all was most affected – but again, no ply-wood split or warped. I think if it had been stored in a damp place much longer, the wheel would have really started to suffer, though. We gave the wheel a light sanding, then applied my favourite magic potion I use on my vintage sewing machines, Parker & Bailey’s ‘Orange Oil Polish’. (Available from Lakeland). Several coats of oil over a period of a couple of weeks, and the wood looks much, much better. 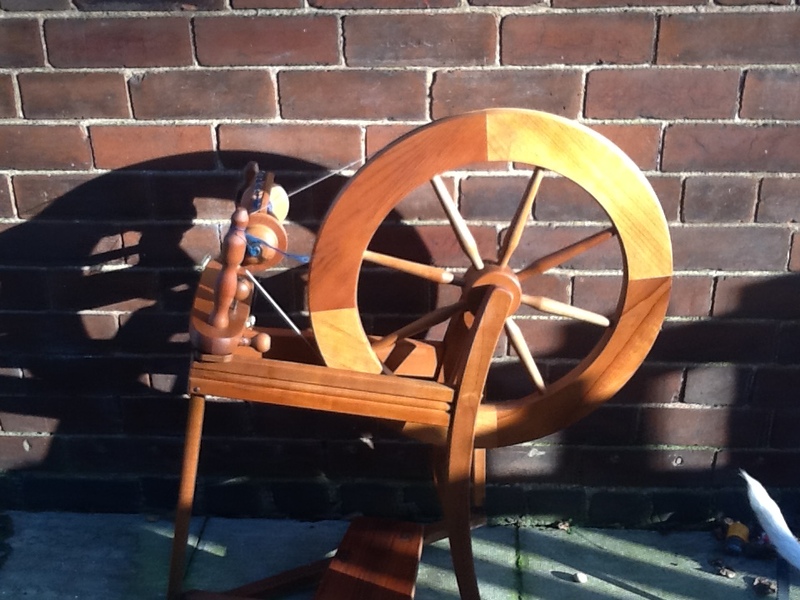 Apart from the treadle which, even with a sanding, looks a little bit – sad. But nothing that affects its functionality, so we won’t be replacing it. I will leave it as a single treadle although double treadle conversion kits exist. I have used double treadle wheels for years but have no problem with single treadle, either. This is another huge advantage of getting a wheel like the Ashford Traditional – you can get spares and upgrade parts, very easily. I can’t really overstate that, as someone who usually has wheels that have hard to track down parts. Life is easier now we have Woodland Turnery, as we can get bits replaced, new bobbins, etc. But life wasn’t always so simple! The repair on Betty, by the way, now has her back to her old self. Apparently, when I bought her, my Timbertops Lonsdale, Betty, had a very old crack in a rather hidden part of the gubbins, which the seller couldn’t possibly have known about, nor did I, despite stripping her down and cleaning as well as I could. The crack was very old, Woodland Turnery thought, as it was literally black. One day, it all got too much and Betty fell apart. She is now fixed. I’m told the Lonsdale was a prototype wheel, essentially, and so many spinners with longer legs than me, find it a bit inconvenient to spin on as there is little clearance above the pedal. I have the legs of Gimli, so no problem here. But thought I better mention it as I’ve extolled the virtues of my Lonsdale in the past, not realising its limitations for people with longer legs – sometimes stumpy legs are an advantage! I should have realised my legs were freakishly short, as we once had an old Volvo, and I could only drive it with the seat as close as physically possible, to the steering wheel and even then I could only reach the pedals at tip toe (and I’m 5’6″). Clearly, a car made for Scandinavian supermodels, not Gimli. 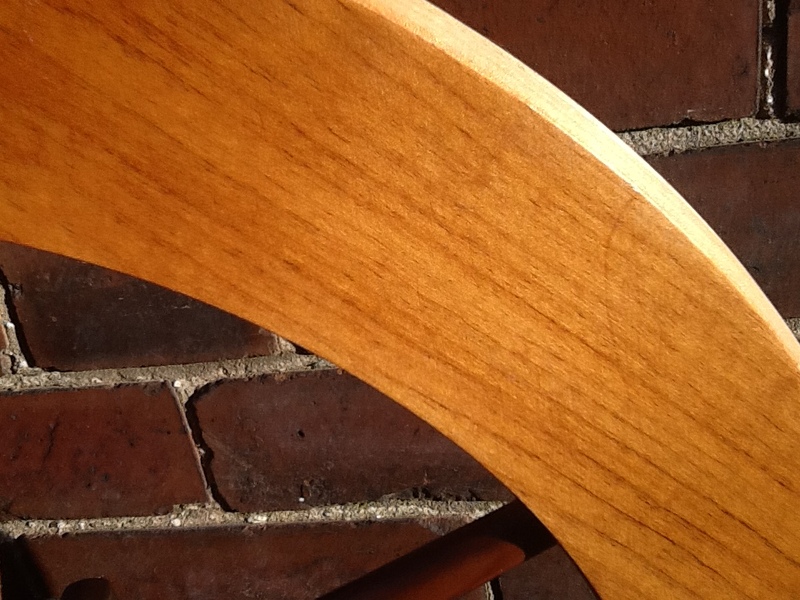 Quick oiling and spin on it this morning, and the Ashford appears like it will be great for demos and teaching. I am going to spend 5 minutes a day teaching myself to spin right handed on it. Because it’s about time I did. My entire spinning life has been spent with uprights with centrally placed flyers or the Chair Wheel with the flyer set to the right of the drive wheels. But I think it makes sense to teach people right handed or left, whichever they choose. (Unlike the Great Wheel where it is, of course, left handed). The wheel was given to us, so we could teach new spinners, so we hope to get plenty of chances to do just that, in the coming year. As he found us at Kendal, I’ve christened him ‘Kenny’ which seems like a suitable war-time name for a war-time design classic. I will be forever grateful to that anonymous woman who came to Kendal with a 1970s’ wheel in her car, on the offchance she’d find someone who could use it. We can and will use it. Life is full of missed opportunities so am glad I took this one, when it presented itself.